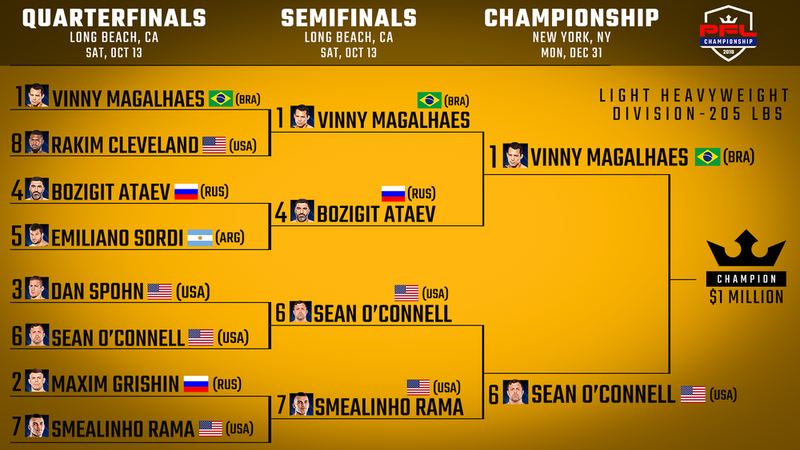 Vinny Magalhaes, Sean O’Connell, Natan Schulte, and Rashid Magomedov each won two fights on Saturday, October 13th, 2018 in Long Beach, California during the Professional Fighters League playoffs and will advance to the inaugural championships. The championships will be televised live by NBC Sports Network from the Hulu Theater of Madison Square Garden on Monday, December 31st, 2018 at 16:00 PT. While we congratulate all the participants, we focus our coverage on the Latino fighters. The Professional Fighters League is the first organization ever to present MMA as a true sport that features a regular season, playoffs, and championship. Individual fighters will control their own destiny, competing in a win-and-advance post-season format. The 2018 PFL season consists of seven regular-season events, a bracket-style playoff, and a $10 million post-season championship prize pool. The premiere season begins with 72 athletes, 12 in each of the six different weight-classes, with one fighter in each division earning the title of true champion. This unique format makes PFL different from other MMA pro leagues. The league format requires the fighters to fight a two-round match of five-minute rounds during the quarterfinals with the winner advancing to a semifinal match. The semifinal matches are disputed the same evening and consist of three rounds of five minutes, at least thirty minutes of rest is allowed to the winning fighter before his second match. The sixth seeded Thiago Tavares of Santa Catarina, Brazil fought the third seeded Islam Mamedov of Dagestan, Russia for an opportunity to advance to a semifinal of the lightweight division. Tavares jogged around in black compression shorts inside of the cage before the fight to warm up. Mamedov, wearing red shorts, landed the first jab of the match and shortly after both fighters would go on to land hard punches to the face of their opponent. Mamedov would then tackle Tavares by the leg and landed several punches as Tavares continued to lie on his back. Tavares, still on his back, followed with an acrobatic maneuver and hooked his legs around the waist of Mamedov. Tavares appeared frustrated as he continued to lie on his back because Mamedov continued to land punches. In what sounded as instructions to Mamedov by his trainers, someone with an audible accent yelled “sit back down and cover the face.” The instructor wanted Mamedov to not get up and continue punching the face of his opponent (cover the face with punches). With ten seconds left, both fighters were back on their feet and the round would end. Tavares began the second and final round with a high kick that Mamedov was able to dodge. Tavares would then trap Mamedov in a headlock from which he desperately and forcefully tried to escape. With about 3:30 remaining in the round, Mamedov was able to maneuver out of the headlock but could not get off his back from the mat despite his efforts. The fight ended after much grappling by both fighters. The judges declared the winner to be Islam Mamedov. The decision was received with audible “boos” from the crowd; but, Tavares would advance despite the defeat because Mamedov could not continue in the tournament because of injury or illness. Thiago Tavares would go on to fight Rashid Magomedov who had defeated Will Brooks via decision. The semifinal match would be the second fight of the night for both fighters. The first round began with minimal action and much pacing. Early in the round, Tavares attempted a takedown by lunging for Magomedov’s legs. Magomedov would then respond with a kick to the face of Tavares. With 2:30 remaining in the first round, the crowd began to boo because of an apparent lack of action by the fighters. Both fighters seemed to respond to the disappointed crowd by kicking more, as if they weren’t satisfied with the results of their earlier punches. Tavares continued with many kicks he did not land and Magomedov responded with a spinning kick which Tavares was able to dodge. The round would come to an end to more “boos” from the fans. Both fighters appeared to throw more punches in the second round. Magomodev kicked high to the head of Tavares who successfully blocked it. Magomodev followed with a hard punch to the face of Tavares. With 2:22 remaining in the round, Tavares ended up on his back while Magomodev did not allow him to get up. But by 1:42 Tavares had positioned himself into leg-locking Magomodev who kept struggling to release himself. Magomodev would eventually release himself while Tavares would continue to lie on his back. Magomodev then pummeled the supine Tavares continuously until earning a technical knockout over him. The Brazilian Tavares would end the night with two defeats. 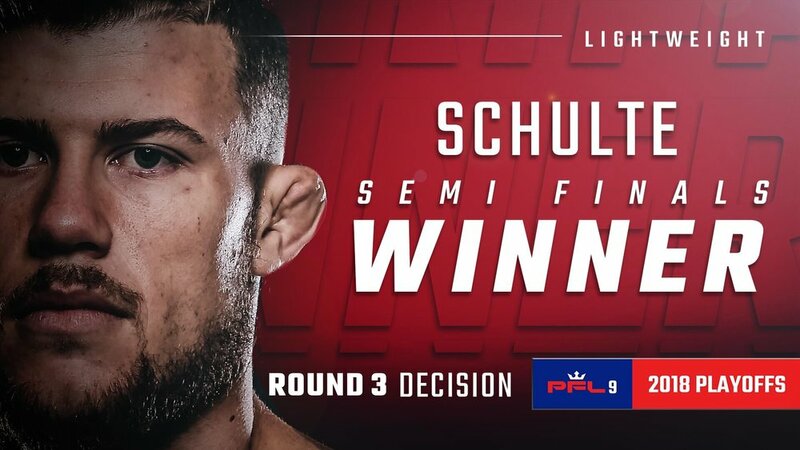 Natan Schulte of Joinville, Santa Catarina, Brazil defeated Johnny Case of Jefferson, Iowa via decision to advance to a semifinal of the lightweight division. Chris Wade of Long Island, New York earned a place in that same semifinal by defeating Robert Watley of La Plata, Maryland via decision. The semifinal match between Schulte and Wade began with Wade keeping Schulte in a chokehold up against the cage. Schulte persisted with resistance and was able to release himself. He gained an advantageous position by placing Wade on his back. Wade remained on his back as Schulte landed punches on him. Wade was able to dodge punches but not all of them. Wade remained supine for over a minute and eventually freed himself with about 1:58 remaining in the first round of the three-round match. With 1:31 left in the round, Schulte tackled Wade onto his back again and lay over him. The round was ending as the crowd roared into chants of “USA, USA, USA” to support of the American fighter. The action continued past the end of the first round as both fighters had to be separated from an intense confrontation. Wade began the second round with a high kick that missed his opponent. A second kick by Wade was caught by Schulte. Wade’s two kicks were followed by several more, possibly displaying a deliberate strategy involving more kicks. Schulte responded with various kicks and punches, some of which he landed while others he did not. Wade taunted Schulte in an attempt to dissuade his opponent from believing the landed blows had hurt him. With 1:28 remaining in the second round, Schulte took down Wade and put him on his back where he would remain because of a strange acrobatic maneuver. Wade would return to his feet and the round came to an end. The third and final round began with jabs from both fighters. Schulte then attempted to tackle Wade but failed. “Let’s go Wade!’ chants could be heard from the crowd. With about 2:39 remaining in the round, Schulte landed a hard kick on the face of Wade. Wade responded by landing several combinations on the face of Schulte which drove him back. The match ended with both fighters trading punches in a spectacular flurry. These two fighters put on an entertaining fight. A member of Schulte’s team carried him on his shoulders as if to influence the judge’s decision of his victory. Schulte would go on to win via a hard earned split decision. The decision resulted in the night’s loudest “boos” from the crowd and Wade expressed his disappointment and anger at the decision at just about every post-fight opportunity. For example, he shouted into the crowd, shouted towards event officials, and strongly expressed disagreement during the post-fight interview. It is understandable for a fighter to express himself in that form after losing such a close fight and consequently the opportunity of a million dollar prize. Emilian Sordi of Rio Cuarto, Cordoba, Argentina fought Bozigit Ataev of Dagestan, Russia for a quarterfinal of the Light Heavyweight division. The fight began with a kick to the face of Ataev by Sordi. Both fighters then hopped back and forth on the balls of their feet as they calculated their opponent’s position. But suddenly and after missing a spinning kick, Ataev landed a right hook which appeared to daze Sordi. From there, Ataev was able to bring Sordi down to the mat by tackling him after catching his left-footed kick. Now dazed, on the ground, and on his back, Sordi was punched on the face with a four punch combination. Ataev’s combination of punches was enough to cause the referee to mercifully stop the fight. The fight was short yet entertaining. Vinny Magalhaes of Rio de Janeiro, Brazil fought Rakim Cleaveland of Coconut Creek, Florida for a quarterfinal match of the light heavyweight division. Magalhaes fought in yellow shorts with a black stripe and Cleaveland fought in black compression shorts. The round began with grappling and hugging which continued until about four minutes remained in the first round. Both fighters then positioned each other against the cage and battled for advantageous positions while simultaneously exchanging kicks. Magalhaes secured the left arm of Cleaveland and acrobatically leaped positioning his legs over the shoulders and on the back of a standing Cleaveland. Cleaveland was brought down with the weight of Magalhaes hanging over his shoulders and contorted into a triangle lock which he would not escape. The victory was Magalhaes’ by submission with about 3:41 remaining in the first round. Vinny Magalhaes would go on to fight Ataev for the semifinal; Ataev having defeated the Argentinian Sordi. Magalhaes began the fight by attempting to tackle Ataev. Next, a maneuver by Ataev brought Magalhaes to his back, but this was not as advantageous as Ataev might have imagined. Magalhaes transitioned and put Ateav on his back as he grabbed his right arm and put it in an arm-bar that caused Ataev to submit shortly after. The Professional Fighter League team brought a well-organized and entertaining event for mixed martial arts fans of southern California. The next round of playoffs will be on Saturday October 20th, 2018 in Washington D.C. at the Entertainment and Sports Arena. And the championships will be in New York, New York at the Hulu Theatre of Madison Square Garden on December 31st, 2018 at 16:00 PT.